That time of year is finally here! The sun is shining and spending time outdoors seems like the norm. There will be plenty of fun in the sun this summer, but don’t forget to protect yourself and your child from the sun’s harsh rays. Even just 15 minutes in the sun can damage unprotected skin, according to the CDC. Many parents worry about keeping baby safe in the sun but we’re here to help! Stick to the shade Babies have very delicate skin so try to keep them in the shade or under an umbrella. Keep in mind, this doesn’t always offer full protection and sunscreen should still be worn. UV rays are the strongest from 10am to 4pm so try to limit sun exposure during this time when possible. Wear sunglasses Besides looking especially cool (and adorable) in sunglasses, your little one will also protect their eyes from UV rays. Find a pair of kid’s sunglasses with 100% UV protection. The Cat Baby in the Hat Hats are great for offering sun protection to the face, eyes, and head. Some kids may not like hats, so try to get them started wearing them as young as possible and use them as a supplement to sunscreen. Dress the Part Wear light colored, tightly woven clothing to reflect the sunlight. If you are heading to the beach or pool, consider having your child wear a rash guard or swim shirt for additional coverage from the sun. Use the right sunscreen Be sure to educate yourself on all the uses of sunscreen and the best type for your child before purchasing sunscreen. The AAP offers recommendations on what sunscreen to get based of your child’s age. Reapply You should apply sunscreen 15-30 minutes prior to going outdoors and reapply regularly throughout the day. Follow the instructions, but typically every 1-2 hours is necessary. Waterproof sunscreens are great for keeping the sunscreen from running into your eyes, but sunscreens are not truly waterproof so always reapply after being in the water! Know the Side Effects Some medications increase skin sensitivity. Ask your healthcare provider and make sure you are aware if this is the case with any medications your child is taking. Follow the leader Make sure you set a good example for your children by also wearing sunscreen, sunglasses, and hats. When your children are older, explain the risks involved with spending long periods of time in the sun without protection. 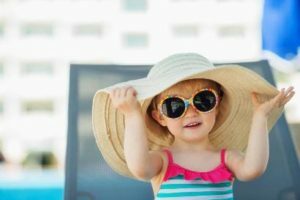 These sun safety tips will not only help babies and kids stay safe in the sun, but also adults too! 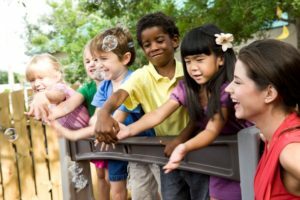 These small and simple steps can give you some peace of mind while you and your child play and explore in the sunshine. Keep your family safe and happy with these summer safety tips.